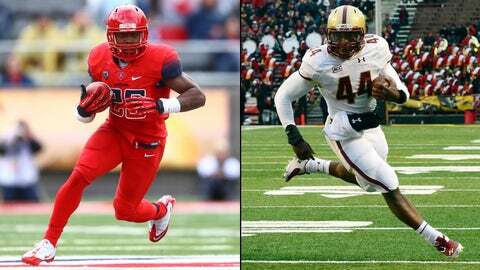 Arizona's Ka'Deem Carey led the nation in rushing in 2012 but finished second in 2013 to Boston College's Andre Williams. TUCSON, Ariz. — Call it the Running Back Bowl. The AdvoCare V100 Bowl — formerly known at the Independence Bowl — in Shreveport, La., will feature Arizona, led by superstar Ka’Deem Carey, and Boston College, featuring national rushing leader and Heisman Trophy candidate Andre Williams. Both teams finished the regular season 7-5. "You’re looking at maybe two first team All-American tailbacks," Arizona coach Rich Rodriguez said Sunday after the matchup became official. "And rightfully so." In describing Williams, who rushed for more than 2,000 yards this season, Rodriguez said, "He’s a fast guy, but he’s a big fast guy. He’s had a great career. It’s a very compelling matchup." Carey is familiar with these sorts of matchups, even in bowl games. Last season, Carey and Arizona took on Nevada and star back Stefphon Jefferson in the New Mexico Bowl, a 49-48 Wildcats win. This year, the opposing feature back is Williams, who ranks first nationally this year with 175.2 yards per game. Carey is second at 156 yards. "I always like playing (against) great backs," said Carey. "I’m excited." Arizona senior linebacker Jake Fischer called it an interesting matchup because of the backs, saying, "We know Ka’Deem is going to go out and do his thing; we need to go out and slow down the other guy." Carey and Williams will be able to share stories before the rest of the Wildcats and Eagles get together, as they’ll meet Thursday in Orlando, Fla., as two of the three finalists for the Doak Walker Award, which goes annually to nation’s best running back. "To tell you the truth," Carey said, "I wish the game was before the Doak Walker because we could just battle it out there. I do think that’s really cool." More importantly, it gives Arizona the opportunity to continue building on the foundation Rodriguez has established. Another bowl game will help in continuing to gain national recognition and respect for a program that will be making its fifth postseason appearance in six years. And for this year’s team, it offers a senior class that has experienced some up-and-down times in Tucson to go out winners. Arizona senior receiver Terrance Miller called the game "a big deal," not so much due to it being his career finale but because the Wildcats will be making their second consecutive bowl appearance. "I just shows where we are going (as a program)," Miller said. "It’s all the things that Coach Rod talked about when he first got here two years ago in changing the culture and bringing in a championship mentality and championship attitude to the program and the city. I think it’s starting to show." With the game being later in the bowl season — Dec. 31, with kickoff set for 10:30 a.m. Arizona time — Fischer said he’s glad in part because he’ll be able to walk for graduation ceremonies before taking the field for one last time. "You never know what’s going to happen after college," Fischer said. "Getting to play another game is special." Rodriguez sees the bowl a bit differently, looking at it from a season-finishing and program-building perspective. "There are a lot of things to build off, but there’s also a lot of unfinished business, too," Rodriguez said after his team’s end-of-the-season banquet. "We’ve got a lot of work to do, but at least the foundation that we want to have a program of championships is there. We just have to do our job as coaches to take it to another level." Certainly a different level from where the Wildcats appeared to be in their regular-season finale, when they were overwhelmed by Arizona State in a 58-21 loss that had Rodriguez "miserable" for more than 48 hours as he set out on the recruiting trail last week. He’ll do so again until Friday, when the team returns to begin practice in preparation for Boston College. "I wasn’t very happy, but I had to go on the road," Rodriguez said. "It was comforting that I was so busy that we’ve (been able to) move past the last game. We are re-energized and refocused for the bowl." Arizona wasn’t expected to end up in Shreveport but was invited to the bowl in part because the SEC, which has an affiliation with the game, didn’t have enough bowl-eligible teams to fill all its spots. "I was just glad we were being considered," Rodriguez said. " You don’t want to be bowl-eligible and not go. We ended up in a great bowl."